By Cathy Halligan . Published on September 13, 2011. It's the multimillion-dollar question: What's the ROI of a Facebook campaign? Usually, that question is answered from a brand or marketing perspective, which leads to much head-scratching and vague conjecture about "greater visibility." That's because the marketing campaign that drives brand reputation and awareness isn't the same as the program that drives sales through customer conversations, joint buying and game dynamics. CMOs are approaching Facebook as an experimental advertising platform, not a viable business-building platform. Simply put, CMOs are doing it wrong. There is a strong and compelling business case for Facebook and plenty of evidence that the site can be used to drive traffic and sales. But CMOs and other execs are falling prey to a handful of blunders that have prevented them from capitalizing on the site's potential. Let's take a look at the biggest four. CMOs can readily say how many Facebook fans their brand has or what the "sentiment" is on the social web, but very few are looking at the Facebook referral traffic to their site and the conversion of that traffic. 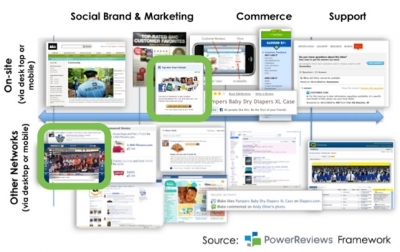 In a recent Forrester report, "Will Facebook Ever Drive eCommerce?" 62% of retailers with an online presence stated that the returns on social marketing were unclear. And 68% stated that if Facebook went away tomorrow, it would not adversely affect web sales. These findings show just how seriously Facebook's capacity for driving traffic and sales is being overlooked. Want evidence of this? Companies such as Amazon, Apple, Netflix, Forever21, eBay and MTV are already finding that Facebook is a significant net new source of traffic that converts to sales. Amazon, unsurprisingly, figured this out more than a year ago, and has had perhaps the most striking success. According to data published in JP Morgan's "Nothing but Net" report, nearly 8% of Amazon's October 2010 traffic was referred from Facebook, an increase of more than 328% from the previous year. Even if this traffic converted at a lower rate than traffic from Google, Facebook sourced up to $25M in sales for Amazon last October. Research from Eventbrite found that every link shared on Facebook generates $2.52 in ticket sales. According to Ticketmaster, every time a user posted in their newsfeed that they purchased a ticket from Ticketmaster, friends spent an additional $5.30 on the site (presumably for the same event). 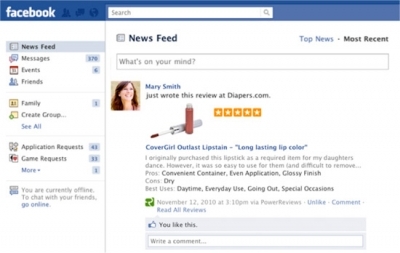 PowerReviews found that when a person shares a customer review on Facebook, $15.72 sales is generated for that retailer (based on a $132 average order value). Since there are many examples of tangible Facebook-sourced traffic and conversion, CMOs could drive sales. To do so, they need to voice that expectation and hold their team accountable for customer programs to generate and share content that drives sales vs. just Facebook fan count. CMOs have traditionally devoted too much mindshare and budget to top-of -the-funnel programming rather than broadening their focus to include sales. They also continue to be over-reliant on traditional media channels instead of driving growth through the social web. The same is true of their primary partners -- ad agencies -- who are skilled in brand building and marketing communications, but have little experience in programs that drive sales via the social web. Unfortunately, the entire Facebook strategy is often left to the agency, and brands are left scratching their heads when a flashy app doesn't result in an uptick in sales. One of the biggest problems I see across the board is that companies are taking a one-size-fits-all approach to Facebook, rather than mapping strategies to the desired business outcome. 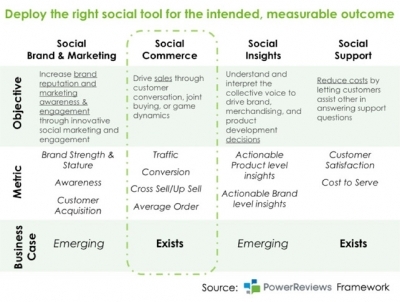 There is a social tool to drive a range of outcomes. These themes manifest themselves in marketing programs represented in this framework below. The top half of the framework is social programming executed on one's site, accessed through a mobile or PC interface. The top half of the framework is social programming executed on another domain, such as a social network or Google, visible through a mobile or PC interface. CMOs in particular are often too anchored to brand-building efforts, and try to apply the same tools to drive sales. Let me illustrate my point with two examples. 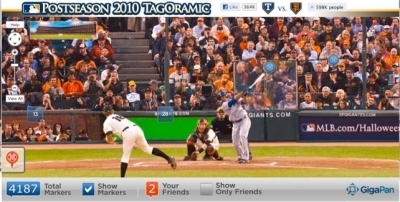 In late 2010, Major League Baseball introduced "TagOramic," a campaign that allowed fans to tag themselves and their Facebook friends in panoramic photos taken during the postseason. This was an innovative social-marketing campaign that heightened awareness and reinforced the love of the game, but didn't include a call to action that drove sales. Simply putting an image in the right hand rail of a team jersey or iPhone case with a "Buy Now" button would have driven sales. An example of a successful social-commerce campaign can be found by looking at Amazon, which allows you to log into the site using Facebook Connect. This lets you see which of your friends have birthdays coming up, along with gift suggestions based on products they've purchased or liked. Here again, Amazon is ahead of the game in leveraging Facebook in a very targeted way to drive sales. Any way you look at it, the future of nearly every business is intimately entwined with Facebook, because those who use their products and services are. Users now spend more than 700 billion minutes per month on the site, meaning that savvy executives need to start finding ways to incorporate some of that experience into their own sites. By now, everybody knows that Facebook is about having a conversation, not about one-directional communication. But if it's a measurable return you're after, then try viewing those conversations through an e-commerce lens. Make the act of shopping on your site more personal by bringing recommendations from friends and connections into the shopping process. And conversely, allow your customers to broadcast their opinions on your products back to their friends on Facebook. At 750 million users and counting, Facebook isn't going anywhere anytime soon, and the most successful companies will be the ones who use the site for more than just a snazzy marketing campaign and invest in testing and using it as a business-building platform. 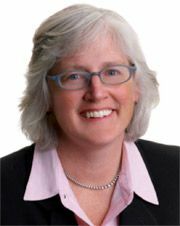 Cathy Halligan is the former CMO of Walmart Stores.com and current SVP of Sales and Marketing for an SF-based start-up called PowerReviews, which powers customer ratings and reviews on brands' and retailers' websites. Cathy Halligan is the former CMO of Walmart.com and current SVP of Sales and Marketing for an SF-based start-up called PowerReviews, which powers customer ratings and reviews on brands' and retailers' websites.